Snyder, Louis L. 1962. Masterpieces of War Reporting: The Great Moments of World War II. New York: Julian Messner. ABOARD A FAST CARRIER IN THE FORWARD PACIFIC AREA, May 11 (Special—Delayed) —Two Japanese suicide planes carrying 1,100 pounds of bombs plunged into the flight deck of Vice Admiral Marc A. Mitscher's own flagship early today, killing several hundred officers and men and transforming one of the our biggest flat-tops into a floating torch, with flames soaring nearly 1,000 feet into the sky. For eight seemingly interminable hours that followed the ship and her crew fought as tense and terrifying a battle for survival as had ever been witnessed in the Pacific, but when dusk closed in, the U.S.S. Bunker Hill—horribly crippled and still filmed by wisps of smoke and steam from her smoldering embers—was plowing along under her own power on the distant horizon, safe. Tomorrow she will spend another eight terrible hours burying at sea the men who died to save her. From the deck of a neighboring carrier  a few hundred yards distant I watched the Bunker Hill burn. It is hard to believe that men could survive those flames or that metal could withstand such heat. One minute our task force was cruising in lazy circles about 60 miles off Okinawa without a care in the world and apparently without a thought of an enemy plane. The next the Bunker Hill was a pillar of flame. It was as quick as that—like summer lightning. The oriental equivalent of Lady Luck was certainly riding with Japan's suicide corps today. Fleecy white, low-hanging clouds studded a bright sky to conceal the intruders from lookouts manning all the stations on the ships of Task Force 58. Not until the Japs began their final plunge from the cover of these clouds did the kamikazes become visible. And it was sheer luck, of course, that they happened to strike on the particular day and at the exact hour when their target was most vulnerable. Since there was no sign of the enemy and because the Bunker Hill and her men were weary after 58 consecutive days in the battle zone off Iwo Jima, Tokyo, the Inland Sea and Okinawa, her crew was not at general quarters when she was hit. For the first time in a week, our own ship had secured from general quarters an hour or two before. Some of the water-tight doors that imprisoned men in small, stifling compartments were thrown open. The ventilators were unsealed and turned on, and those men not standing the regular watch were permitted to relax from the deadly sixteen-hour vigil they had put in at battle stations every day since we had entered the danger area. So it was on the Bunker Hill. Exhausted men not on watch were catching a catnap. Aft, on the flight deck, 34 planes were waiting to take off. Their tanks were filled to the last drop with highly volatile aviation gasoline. Their guns were loaded to the last possible round of ammunition. Young pilots, mentally reviewing the briefing they had just received, were sitting in the cockpits warming up the motors. On the hangar deck below, more planes—also crammed with gasoline and ammunition—were all set to be spotted on the flight deck, and in the pilots' ready rooms, other young aviators were kidding around, waiting their turn aloft. Just appearing over the horizon were the planes returning from an early mission. They jockeyed into the landing circle and waited until the Bunker Hill could launch her readied craft and clear the deck for landing. Then it was that a man aboard our ship caught the first glimpse of three enemy planes and cried a warning. But before general quarters could be sounded on this ship, and before half a dozen shots could be fired by the Bunker Hill, the first kamikaze had dropped his 550-pound bomb on the ship and plunged his plane squarely into her 34 waiting planes in a shower of burning gasoline. The delayed-action bomb pierced the flight deck at a sharp angle, passed through the side of the hull and exploded in mid-air before striking the water. The plane, a single-engined Jap fighter, knocked the parked aircraft about like ten-pins, sent a huge column of flame and smoke belching upward, and then skidded crazily over the side. Some of the pilots were blown overboard by the explosion. Many managed to scramble to safety. But before a move could be made to fight the flames, another kamikaze came whining out of the clouds, straight into the deadly anti-aircraft guns of the ship. This plane was a Jap dive bomber, a Judy . A five-inch shell that should have blown him out of the sky set him afire and riddled his plane with metal. But still he came. Passing over the stern of the ship he dropped his bomb right in the middle of the blazing planes. 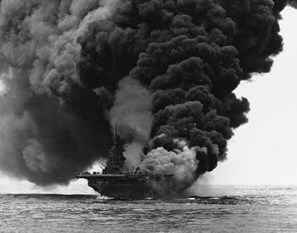 Then he flipped over and torched through the flight deck at the base of the "island." The superstructure, which contains many of the delicate nerve centers from which the vessel is commanded and controlled, was enveloped in flames and smoke which were caught in turn by the maws of the ventilating system and sucked down into the inner compartments of the ship. Scores of men were suffocated in these below-deck chambers. Minutes later a third Jap suicider zoomed down to finish the job. Ignoring the flames and the smoke that swept around them, the men in the Bunker Hill's gun galleries stuck to their posts, pumping ammunition into their weapons and filling the sky with a curtain of lead. It was a neighboring destroyer, however, which finally scored a direct hit on the Jap and sent him splashing harmlessly into the sea. That was the end of the attack and beginning of the fight for survival. The entire rear end of the ship by this time was burning with uncontrollable fury. It looked much like the newsreel shots of a blazing oil well only worse, for this fire was feeding on highly refined gasoline and live ammunition. Smoke rose in a huge column from the stern of the ship, shot through with angry tongues of flame. Blinding white flashes appeared continuously as ready ammunition in the burning planes or in the gun galleries was touched off. Every few minutes the whole column of smoke would be swallowed in a great burst of flame as another belly tank exploded or as the blaze reached another pool of gasoline flowing from the broken aviation fuel lines on the hangar deck below. For more than an hour there was no visible abatement in the fury of the flames. They would seem to die down slightly as hundreds of thousands of gallons of water and chemicals were poured on them only to burst forth more hungrily than ever as some new explosion occurred within the stricken ship. The carrier itself was listing and as each new stream of water was poured into her, the angle increased more dangerously. Crippled as she was she plowed ahead at top speed, and the wind that swept her decks blew the flames and smoke astern over the fantail, prevented the blaze from spreading forward on the flight deck and through the island structure. Trapped on the fantail itself, men faced the flames and fought grimly on; with only the ocean behind them, and no way of knowing how much of the ship remained on the other side of that fiery wall. Then, somehow, other men managed to break out the huge openings in the side of the hangar deck, and I saw the interior of the ship. That, I think, was the most horrible sight of all. The hangar deck was a raging blast furnace. Even from where I stood the glow of molten metal was unmistakable. By this time the explosions had ceased and a cruiser and three destroyers were able to venture alongside with hoses fixed in their rigging. Like fire boats in harbor they pumped great streams of water into the ship, and the smoke at last began to take on that grayish tinge which showed that somewhere a flame was dying. Up on the bridge, meanwhile Capt. George A. Seitz, the skipper was concerned about the list his ship had developed. He resolved to take a gambling chance. Throwing the Bunker Hill into a 70-degree turn, he heeled her cautiously over onto the opposite beam so that the tons of water which had accumulated on one side were suddenly swept across the decks and overboard on the other. This wall of water carried the heart of the hangar deck fire with it. That was the turning point in this battle. After nearly three hours of almost hopeless fighting, she had brought her fires under control, and though it was many more hours before they were completely extinguished, the battle was won and the ship had been saved. A goodly thick book could not record all the acts of heroism that were performed aboard that valiant ship today. There was the executive officer, Commander H. J. Dyson, who was standing within 50 feet of the second bomb when it exploded and who was badly injured, yet refused medical aid and continued to fight the blaze until it was safely under control. There was the squad of Marines who braved the white heat of the hangar deck to throw every bomb and rocket out of a near-by storage room. But the most fruitful work of all, perhaps, was performed by the pilots of the almost fuelless planes that had been circling overhead for a landing when the ship was struck. In the hours that followed, nearly 300 men went overboard, and the fact that 269 of these were picked up by other ships in the fleet was due, in no small measure, to the work of these sharp-eyed airmen. Although our own flight deck had been cleared for their use and they had been instructed to land on it, these pilots kept combing every inch of the surface of the sea, tearing packets of dye marker from their own life jackets and dropping them to guide destroyers and other rescue vessels to the little clusters of men they saw clinging to bits of wreckage below them. Calculating their fuel supply to a hair's breadth, some of them came aboard us with such a close margin that a single wave-off would have sent them and their planes into the sea before they could make another swing about the landing circle and return. In all, I am told, 170 men will be recommended for awards as a result of this day's work. Late today, Admiral Mitscher and 60 or more members of his staff came aboard us to make this carrier his new flagship. He was unhurt—not even singed by the flames that swept the Bunker Hill—but he had lost three officers and six men of his own staff and a number of close friends in the ship's company. It was the first time in his long years of service that he had personally undergone such an experience. As he was hauled aboard in a breeches buoy across the churning water that separated us from the speedy destroyer that had brought him alongside, he looked tired and old and plain, downright mad. His deeply lined face was more than weather-beaten—it looked like a badly eroded hill. But his eyes flashed fire and vengeance. He was a man who had a score to settle with the Japs and who would waste no time going about it. He had plans that the Japs will not like, not at all. But the enemy is already on the losing end of the Bunker Hill box-score. Since she arrived in the Pacific in the Fall of 1943, the Bunker Hill had participated in every major strike. She was initiated at Rabaul, took part in the invasions of the Gilberts and the Marshalls, pounding at Kwajalein and Eniwetok. With Task Force 58 she had struck twice at Tokyo and also at Truk, the China coast, the Ryukyus, Formosa, the Bonins, Iwo Jima and Okinawa. During this time the pilots of her air groups have sunk or damaged nearly a million tons of Jap shipping. They have shot 475 enemy planes out of the air, 169 of them during the last two months. In two days here off Okinawa, they splashed 67 Nipponese aircraft and the ship herself has brought down 14 more by anti-aircraft fire. On a raid last March at Kure Harbor, when the Japanese fleet was hiding out in the Inland Sea, Bunker Hill planes scored direct bomb hits on three carriers and one heavy cruiser, and then sent nine torpedoes flashing into the side of the enemy's beautiful new  battleship, Yamato, sinking her . In the Jap column stands the fact that at the cost of three pilots and three planes today the enemy killed a probable total of 392 of our men, wounded 264 others, destroyed about 70 planes and wrecked a fine and famous ship. The flight deck of that ship tonight looks like the crater of a volcano. One of the great 50-ton elevators has been melted almost in half. Gun galleries have been destroyed and the pilots' ready rooms demolished. Virtually the entire island structure with its catwalks . . . is a twisted mass of steel, and below decks tonight hospital corpsmen are preparing 352 bodies for burial at sea, starting at noon tomorrow. But the ship has not been sunk. Had it been, it would have taken years to build another. As it is the Bunker Hill will steam back to Bremerton Navy Yard under her own power and there will be repaired. While she remains there, one American carrier with a hundred or so planes and a crew of 3,000 men will be out of action. But within a few weeks she will be back again, sinking more ships, downing more planes, and bombing out more Japanese airfields. Perhaps the next task will be to cover the invasion of Tokyo itself. Details of the kamikaze attack on U.S.S. Bunker Hill (CV-17) and the horrific aftermath can be found in Maxwell Taylor Kennedy's 2008 book entitled Danger's Hour: The Story of the USS Bunker Hill and the Kamikaze Pilot Who Crippled Her. Louis Snyder provides background information to this article on pp. 487-8 of Masterpieces of War Reporting: The Great Moments of World War II (1962). Some is incorrect such as the following three items. He states that the kamikaze attacks started at the sea battle of Leyte on October 29, 1944, but actually the date was October 25. The background indicates that the cherry blossom was the insignia of the kamikaze pilots, but only the Kamikaze Special Attack Corps ōka (or ohka) rocket-powered glider pilots officially used the cherry blossom as their emblem. Snyder introduces the "Kamikaze Song of the Warrior," but this is actually Umi Yukaba (If I go to sea), which was a popular song among all in the Japanese military. 1. Adams was on board U.S.S. Enterprise (CV-6) when he witnessed the kamikaze aircraft attacks on U.S.S. Bunker Hill. 2. Both kamikaze aircraft that hit Bunker Hill were Zero fighters that carried bombs (Rielly 2010, 268). The second kamikaze aircraft was not a Judy dive bomber. 3. The battleship Yamato, commissioned in December 1941, was not new. 4. The battleship Yamato, on the way from mainland Japan to Okinawa, was sunk by multiple bombs and torpedoes dropped by American aircraft on April 7, 1945.